Wishing you a safe, happy, healthy Thanksgiving holiday! 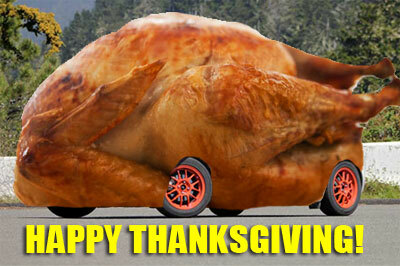 I hope you enjoy this semi-disgusting picture of a turkey Photoshopped onto my Yaris as much as I do. Festive, no? Although now that I think of it, the idea of edible transportation is somewhat intriguing, although turkey would probably be towards the bottom of the list due to spoilage. But enough about me. Would someone pass the yams?